The Third Party Quality Inspection article provides you with information about quality which is one of the scopes of work for third party inspection agencies. This term is generally used in the shop inspection and pre-shipment inspection. Assume an oil company orders a gas compressor to the compressor manufacturer. After delivery of the proforma invoice and purchase order, an inspection and test plan is agreed upon between the oil company and gas compressor manufacturer. The oil company might have a qualified inspector in its organization and dispatch this person for inspection hold and witness points to a gas compressor manufacturer factory. So this will not be third party inspection; this will be second party inspection. The oil company might hire a third party inspection company to do the inspection, report and issue an inspection release note. There is an inspection and test plan in place and the hold and witness points are known. The gas compressor manufacturer will send an inspection notification in advance, and afterwards, the Oil Company approval will be sent to Third Party Inspection Company. These hold and witness points are for doing a test such as a rotor balancing test, performance test or run-out test. All of these tests apply and refer to the quality, so it is called third party quality inspection. The oil company may decide to do the shop inspection by its own inspector( like the first option) but for pre-shipment inspection, they may hire a third party inspection company to control quality, quantity, packing , marking and loading inspection and issue an inspection certificate for LC (Letter of Credit) and for the buyer's and seller's bankers requirement. 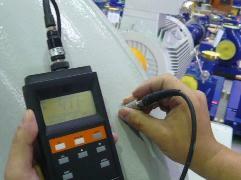 In this scope of work, the task of Third Party Inspection Company will be visual quality not quality. There is a different between visual quality and quality. The visual quality refers only to the visual inspection and review of tests and quality control documents. But quality refers to witnessing of some important tests and document reviews. Our exampled oil company can order for more inspection services to the third party inspection company such as quantity, packing, marking and loading inspection. For more information, please review the Pre-Shipment Inspection article.